Over a year ago, I watched as this man took one step, then two, then three, to become a nominee in the Republican Party for President of the United States. I watched and saw it coming as many said ‘no way..’.. ‘it won’t happen’.. I even said, ‘it can’t be’. I watched as people laughed, because they didn’t think it would ever happen. Or those that knew it would, smiled coyly, having no doubt. Today, we know, he did it. Donald Trump, having never held a public office, often arrogant, rude and having a serious obsession with social media- (of which someone needs to school the man on public image and the need to stand taller than his critics), is now the President. My President. And today, the day before his inauguration, many protesting (their right), many are crying, many are marching, and many are just plain ole unhappy sitting in their living rooms watching the news that best aligns with their ideas. But, I ask, how many are praying? You see, I was originally surprised by this election. I do not pass judgement on Donald Trump, however, he hasn’t hidden his character from the public eye, so I do pass judgment on some character qualities that I believe to be less than admirable for the President of the United States. I’ve witnessed too many attacks against people over the years to overlook it. He’s attacked the body image of women, made fun of a person with a disability (I saw it originally, and there is no denying it), to name a couple examples. He is offensive. Still, he is now my President. Our society has changed so much since I was a child. Respect seems to be an admirable quality of the past- respect that was once taught from an early age, and expected, has seemed to fly away with the age old idea of writing a letter to a friend, or dialing a phone number to simply say hello to someone. No, today it is a quick text, usually so abbreviated it’s hard to understand. As though typing love vs luv is difficult. The quick touch of a phone pad or keys, in angry haste, just to reply to someone’s comment, also typed in angry haste, has led to a complete lack in communication and again, respect. Today, I’m saddened to say, our new President is often right in the center of such texting, typing and social media sharing nonsense. I have to question how, as a society, did we get here? Our differences should unite us as a rich, diverse and blossoming country. Leading by example of love, generosity, kindness, acceptance and yes, respectful appreciation of one another, in those differences. Have moral standards now plummeted so deep, that we don’t even have standards? I could sit here and point fingers at flaws in our President, or I can sit here and ask my community, and myself, to rise up. To take back our country by taking on the issue of respect, or lack of. I have no doubt the next four years will be disheartening to some, non-eventful to some, disappointing, joyful, questionable, or possibly even history making. We all have ideas and opinions on our new President, and whether you like it or not, he IS your President. Unless you would like to denounce your citizenship and move on out of here. 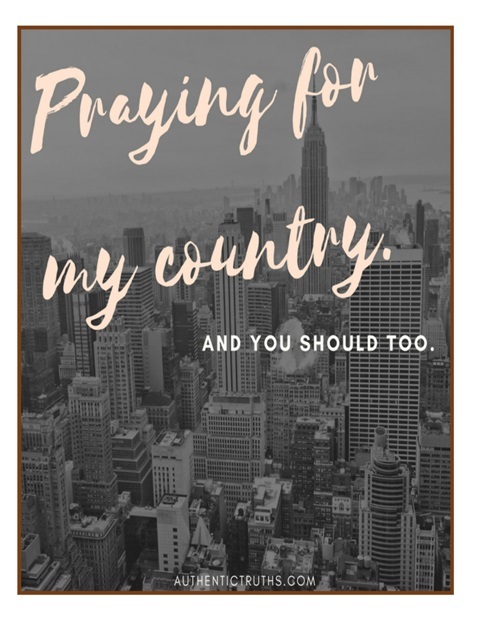 But instead of posting daily attacks of his decisions, because contrary to popular belief, you posting something on your social media isn’t being an active and engaged citizen, why not stop, and pray. Here’s the next newsflash, people no longer believe the stories on the internet, they may like and comment in agreement, but it’s because they agree with your anger, and your stance, which is clearly against, or for, YOUR President. The catch phrase, ‘reputable source’, no longer holds water folks. Credibility is lost. Why? Because we bought into the now coined ‘fake news’. WE sold their junk, we shared, sending stories viral that were juiced up for the exact response we’ve given them. We blame the media, when truly, it’s our fault. People are sitting and scrolling through these stories, looking for the click bait headlines that best tear up our leaders, and sharing away. You want to share something? Share a word of encouragement, a word of RESPECT, hope, kindness, compassion, and decency. Those stories do exist, and they are so inspiring they don’t need to be juiced up for ratings. Politics aren’t everything. Before we are a Republican, Democrat, or Independent, or whatever new ‘title’ suits your fancy, we are Christians. Some of us may be a part of the armed services, but all of us are a part of the Lord’s army, and HE is who we represent. Just because Donald Trump is the President of a country, doesn’t mean he represents me. He and I may not agree on the political issues that surround this country and world, and they don’t have to. In fact, no President has ever had 100% agreement by their societies. You may not like the character of this man, but that doesn’t mean you should spout hate, no matter how nice you do it, towards him. We cannot have expectation of others that we do not have of ourselves. Pray. Pray for President Donald J. Trump, because we are told to. Whether you like it or not, the word honor is in there. It doesn’t say to only honor those who are upstanding and of good character, though I think we interpret things that way. It doesn’t say honor, but share false news about people. It says to respect everyone, which includes our President, to love one another, to fear God and honor our leaders. There are many scriptures about staying away from bad company, but those references are for you personally, about guarding your heart, and to not fall prey to such people. To honor and to pray for our President is simply expected of us, and a righteous thing to do.